Tag Archive | "Shawn Grawbarger"
Brandonn Kramer poses with his state record black buffalo, taken while bowfishing on the Grand River in Ottawa County this past May. Courtesy photo. The Department of Natural Resources confirmed the catch of a new state record black buffalo on June 12. The fish, a member of the sucker family, was caught by Brandonn Kramer of Muskegon, Michigan at 11:30 p.m. on Friday, May 25 on the Grand River in Ottawa County. Assistance was provided by Kramer’s friend and fishing cohort, Shawn Grawbarger also of Muskegon. The fish weighed 46.54 pounds and measured 39.75 inches. Kramer was bowfishing when he landed the record fish. The record was verified by Jay Wesley, a DNR fisheries manager for Lake Michigan. 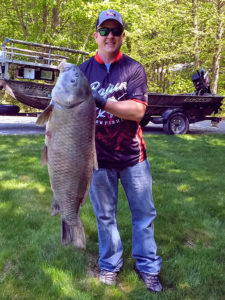 The previous state record black buffalo was caught by Sage Colegrove, of Muskegon, on the Grand River in Ottawa County on April 12, 2015. That fish weighed 44.54 pounds and measured 38.5 inches. State records in Michigan are recognized by weight only. To qualify for a state record, fish must exceed the current listed state record weight and identification must be verified by a DNR fisheries biologist. For more information, visit Michigan.gov/masterangler.